God came to be with us. This spectacular truth is the center point of the Christmas story. In this message we zoom into why Jesus came and who Jesus was. 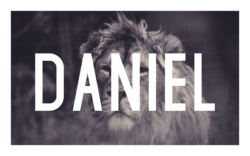 Daniel receives a prophetic vision in chapter 2 of the book of Daniel that outline future events yet to come. What do we make of these kinds of prophecies in the Old Testament? In this message we look at this incredible prophecy to see how God is sovereign over all time and circumstance.